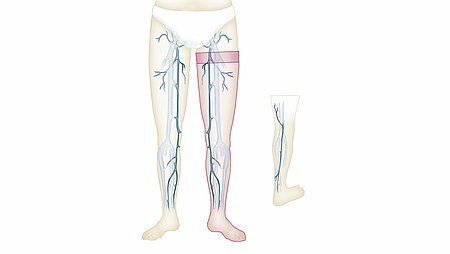 The affected veins in the superficial venous system are pulled out through small incisions in the skin (stripped). This procedure is also known as "Babcock's procedure" or "Babcock's stripping". The American doctor Babcock described the method for the first time in 1907. This classic method is used to remove the affected segments of the worst affected long saphenous vein that runs from the ankle up to the inguinal fold. The procedure is carried out under local anaesthetic or under general anaesthesia. The doctor makes the second incision below the affected segment of the vein. 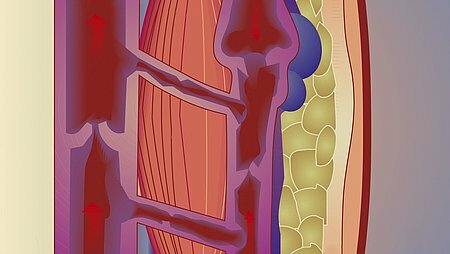 If the whole saphenous vein is affected by varicose vein disease, the vein is exposed slightly above the medial malleolus (ankle bone) and also tied off. A thin, flexible probe, the so-called Babcock probe or vein stripper, is usually advanced up the saphenous vein to the groin. After the procedure, the incisions are closed and a compression dressing wrapped tightly around the leg. Anti-embolism garments, such as mediven struva.